Renewable energy is set to change the energy landscape of the region and its benefits are plentiful. 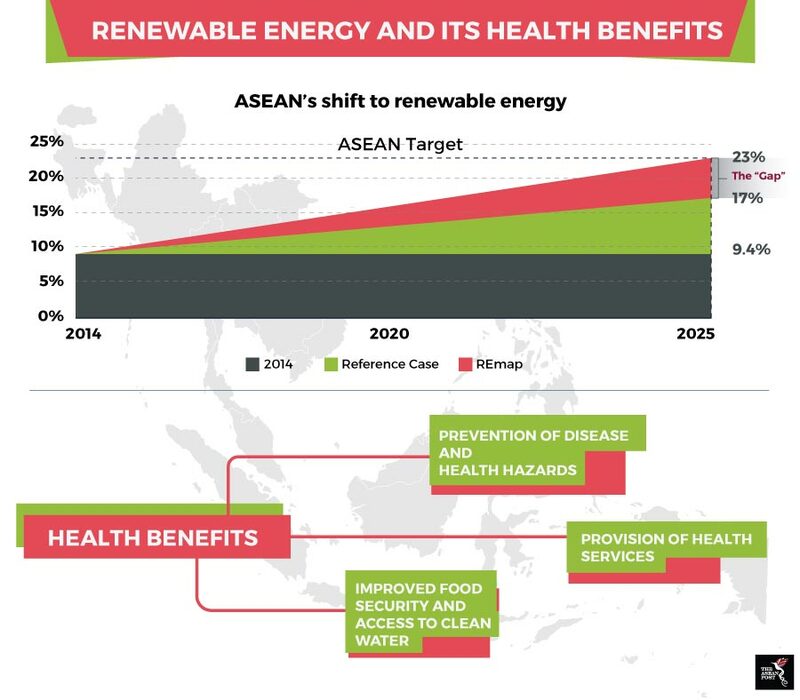 The regional goal is to ensure 23 percent of the Association of Southeast Asian Nations (ASEAN) primary energy mix is made up of renewable energy by 2025. However, many of those living in Southeast Asia’s remote villages are still reliant on traditional biomass like firewood for heating and age-old diesel generators for intermittent electricity supply. Hence, the solution has to, in effect, accomplish two things – provide rural areas with access to electricity and alternative energy, whilst ensuring the environment isn’t harmed. In doing so, rural villages enjoy the health benefits that accompany their use of renewables. According to the International Energy Agency (IEA), in 2015, approximately 270,000 premature deaths occurred in the region due to indoor pollution. A significant contributor to this startling number is the use of traditional indoor cooking and heating practices. These inefficient methods usually produce dangerous levels of carbon monoxide, which when trapped within a confined area due to poor ventilation, can be detrimental to the health of children as well as adults. The renewable solution is the biogas digester which uses bioenergy for cooking and heating. Biogas digesters rely on animal waste to harness methane gas for energy generation. Methane is a greenhouse gas which traps heat 21 times more than carbon dioxide and negatively impacts the climate. This solution has been deployed in rural communities in Vietnam and Cambodia. In Vietnam, 250,000 biogas digesters helped reduce harmful particles in kitchens by 80 percent - from 73 micrograms per cubic metre (µg/m3) to 28 µg/m3 - just slightly shy of the World Health Organisation’s (WHO) safety guideline of 24 µg/m3. According to a report by the International Renewable Energy Agency (IRENA), the improvement in air quality helped prevent an estimated 750 premature deaths and saved 27,700 disability-adjusted life years (DALY). Another example of how renewable energy can improve health is in the healthcare services industry. Efficient rural healthcare is undergirded by a steady supply of electricity to power the various life support and treatment machines in hospitals or clinics. This has been exemplified in rural Myanmar where a micro-hydro plant is used to power clinics which provide maternity services to the local community. Besides that, solar energy is used by Sunlabob Renewable Energy, a private company specialising in sustainable renewable solutions in partnership with the Lao PDR Ministry of Agriculture and Forestry and Asian Development Bank (ADB) to install 44 solar powered refrigeration and cooling systems in several rural provinces in the country. These systems ensure the reliable storage of chemicals, medications and vaccinations which are used to treat 11,000 Laotians. Refrigeration systems powered by renewable energy also aid in ensuring food security for rural communities. According to IRENA, adequate access to refrigeration can prevent the putrefaction of 20 percent of perishable foods in places where access to energy is generally unreliable. For example, on Green Island in the Philippines, a renewable energy microgrid generates enough electricity to produce one tonne of ice per day which in turn helps to preserve the daily catch by local fishers. This has led to an estimated 40 percent increase in income for local fishermen. Renewable energy can also be used to power irrigation systems and pumps which in turn contribute to improved yields. Another way of increasing yield from limited land is to utilise biomass as fertiliser instead of using inorganic fertiliser. In rural Vietnam, farmyard manure helps increase crop yields by up to 20 percent. Paddy rice production – a key staple for the region – was also boosted to an estimated three million tonnes from 2.5 million. Renewable energy powered water desalination can also serve as an efficient solution to improve water security in rural areas. Such solutions can help in improving the pumping, boiling, disinfecting, purifying, distribution and storing of clean water. The 1001fontaines project in Cambodia saw the introduction of a solar powered water purification system which provides 400,000 people in rural villages with access to clean drinking water. Clean energy means a cleaner environment and better standards of living for everyone. Whether in urban areas or in villages, the health benefits that could potentially accompany a shift to renewables cannot be dismissed lightly.